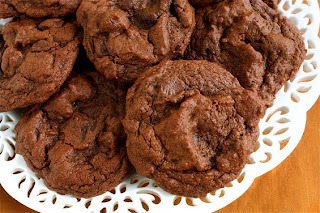 Tyler requests these chocolate chocolate cookies at least once a week. I'm such a mean mom and don't make them quite that often! If you're in a hurry, these cookies are great! So easy, even my 3-year old remembers all the ingredients! 2. Mix cake mix, eggs & butter together. Good boy! He must take after his dad's sweet tooth side of the family :). It was great to see you guys yesterday.